My bed is my sanctuary. I know everyone needs sleep and, therefore, pretty much everyone looks forward to laying down on a comfy bed for a peaceful slumber. But if you asked someone, "what is your happy place?" Chances are they'd mention tropical islands, beaches, gardens, with friends or family, etc. My happy place is my bed. I'm not particularly proud of it, but I'm coming to terms with it. It's my place to think and dream. It's my place to escape. It's a place of rest and recovery. It's the place where I feel the least amount of anxiety. If I am feeling anxious, I guarantee if I can lay down in my bed, it will dissipate very soon. If I am in the midst of panic and unable to physically get to my bed, my bed is what I visualize and it helps me to sit in my feelings/symptoms and "float." The reprieve from anxiety is why I am quick to go to bed at night and slow to leave it in the morning. It is my most reliable coping mechanism. It's been there since the beginning. Usually my happy place is my home, however because we're remodeling right now it's more of my stress place! Oh how I loathe the chaos of remodeling! I hope your happy place will be restored very soon! I love this! 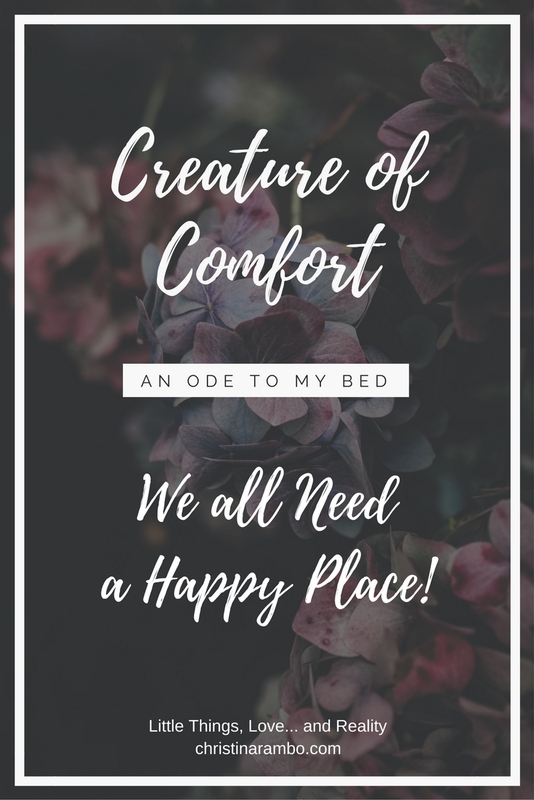 My happy place is my house in general, but I really do love lying in my bed! Love this! My happy place is the beach! My happy place is absolutely my bed!! If I could stay in it and work all day, I totally would! I totally work from my bed too. My husband just doesn't get it... I'm glad others can relate!